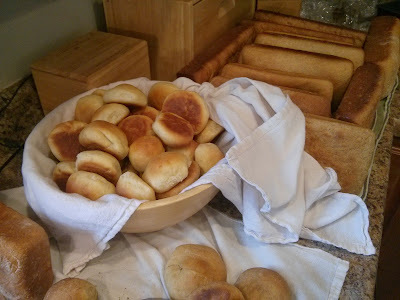 Today I made a ton of bread and kolaches. Technically these are klobasnik, but in Texas Czech culture, they are called kolaches. Aka pig in there blanket. I used whole wheat flour. It is definitely not as silky delicious as a traditional kolache dough, but healthier and still very, very tasty. The sausage was from my neighbor’s parents’ farm. They have a meat locker business. It was quite delicious. I like to bake a lot on one day. I can’t stand planning it on a rigid, bi-weekly or monthly basis. I just bake when I feel like it. Female inweibin, or hauslerin – the hired hands on a farm, were required to bake every two weeks. Something I think about now every time baking day comes around is what if they never felt like baking? It was still part of their job. I’m so lucky, with my flexible schedule and broad range of potential ways to spend my time or divert my attention.